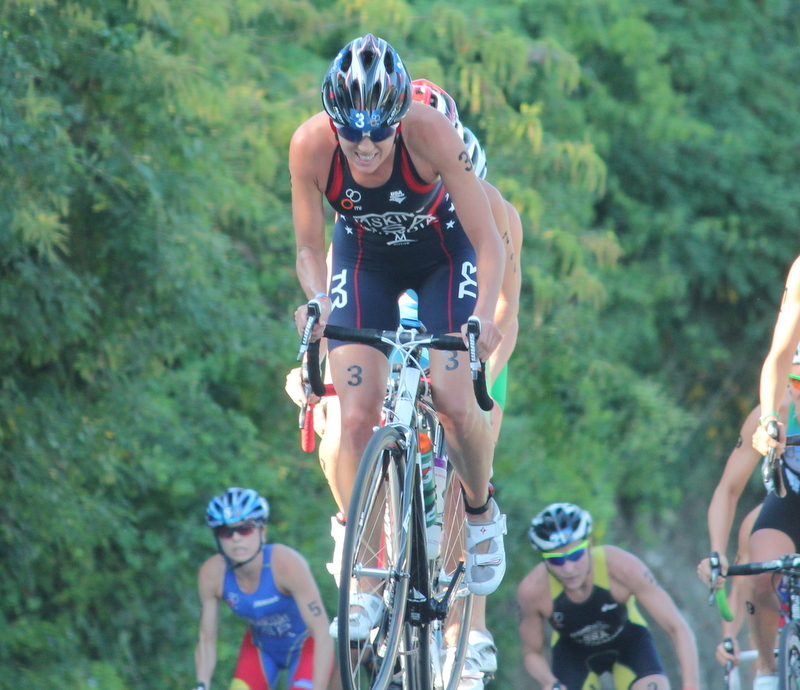 Hills, heat and humidity were all factors in the Huatulco World Cup Sunday in Mexico. The race fortunately started at 8:00AM for the women, so it was not as hot as it was for the men with a 10:45AM start time. I did complete an Olympic distance course, with a time of 2:14+….at least 14 minutes slower than most every course I have been on, which shows how challenging the 16 hills (8 on the bike and 8 on the run) were for the athletes. The most surprising aspect of the race, was how warm the ocean water was. My guess is the water was around 86 degrees F, which makes swimming a fast 1500m swim tough!! The start was a short run into the water, with a 1000meter loop followed by run out into a 500meter loop. Seconds before the gun went off, the athletes around me on the starting line took off just before the gun, so I thought there may have been a false start when I heard a whistle, but we were all off to go. Needless to say, my running start was less than par. I chilled behind everyone for about 200meters (although chill would not be the right word, more like taking a beating with getting kicked in the face, etc.). I decided to stop and move to the outside to move up through the swim. By the 350 meter mark, I had moved to first position and took the swim prime. Upon entering the water, I noticed a huge pack behind me and little separation. I also noticed,WOW, I am really, really warm. I decided to chill a little on the second lap and conserve some energy, since I was not swimming too fast in the warm water. I got caught up on the last bouy and ended up exiting about seven seconds behind Flora. Our pack of 14 started to make time over the chase pack during the second portion of the bike. I had a great second transition as far as position getting offthe bike, getting shoes on quickly…I did not run to fast getting to my shoes though! I started off the run in fifth position and held that position most of the 10k. I was close to 4th at the start of the run and did not lose much time the rest of the way, but was thinking in my head not to push too much at the start for fear of a blow up in the heat at the end. Looking back, I should have worked a little harder at the start, instead of running in no man’s land and getting passed by 5th and 6th place towards the end of the race. Also, I have learned that I need to work on my downhills….I was getting smoked on the downhills and running much faster on the flat sections of the course compared to the women around me. We had 8 descent downhills, so that was a considerable amount of time on the course. Most of the courses are pancake flat, so I never really get to compare varied terrains on the run. I did not feel like I was running too quick, but more like survival in the heat!! Last week my race conditions were in 55 degrees and I was COLD and this week was 100+ degree heat index…..so it is tough with the drastic changes in extreme temps. I also learned that next time I swim in 86 degree water, I am going to start with ice….down my suit and in my cap! Hope this will help to keep my core downso that I can swim faster and also feel better once I get on the bike. Nate and I enjoyed our time in the tropical, remote town in Mexico. The town is beautiful and the people are so freindly. My little bit of Spanish knowledge has helped me get by. It will be a long travel day home, but looking forward to preparing for the next race in Puerto Vallarta, Mexico. 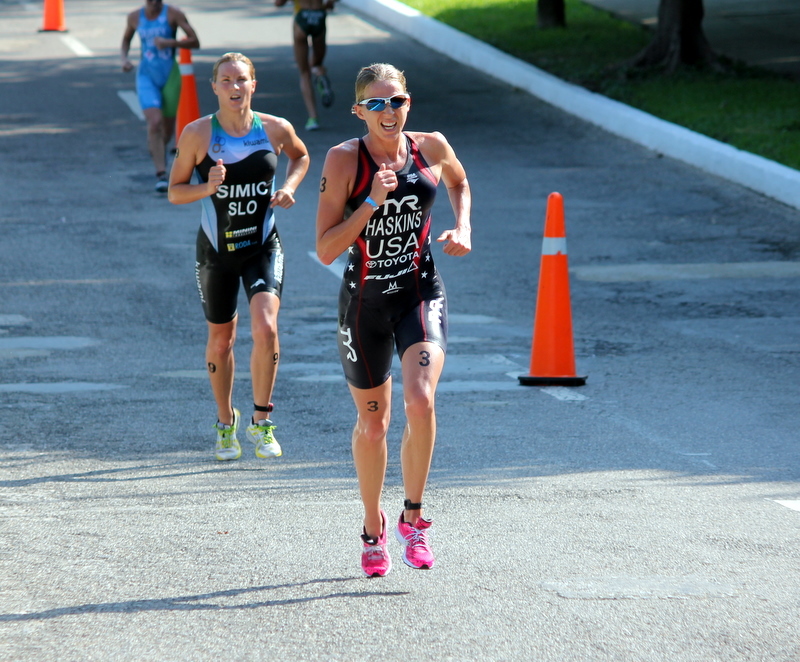 Another hot one, but if any race could prepare me more for Pan Ams, I would have to say this one! Looks like the next eight days in Colorado will be completed with extra layers of clothing…also thinking I should swim in my wetsuit in the pool to help me prepare for the warm water! !